I was not happy when I reached the conclusion or final part of The Hobbit because I didn’t want it to end! Sometimes I’m happy when I reach the conclusion or end of a book because the book wasn’t all that great, but there are just some books that are so good. I’m glad that the movies of The Hobbit came out, but I didn’t like it when I saw the conclusion or last part of those either since they were also so exciting. To make things better, I’ve begun to write a really good book with no conclusion or ending part at all that will take care of this problem once and for all. Quiz: Try again! What is a conclusion? It is the part of the day right before you go to bed for the night. It is the part of a book where you stop reading on a given day. It is the point of something past which there is no more. The conclusion of something, such as a book or thought, is its end, last part, or close. Conch Shell Illusion I've reached the conclusion that conch shells are but an illusion, and so soon will all disappear since they never really existed in the first place! 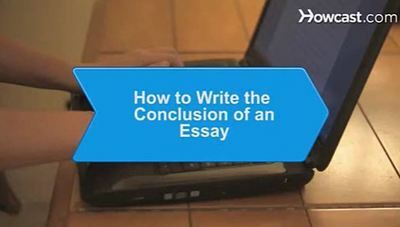 HowCast: How to Write a Conclusion How to write a good conclusion to a paper.